This caught my eye in the September issue of Country Home. It is tile wainscot. We had planned on using subway tile for the bathroom downstairs, but this is an intriguing new option. I love the way it looks, but I worry that once I get it up it will look to modern for my tastes. I visited the web site in the magazine, http://www.klaffs.com/, but couldn't find any information on this specific tile type. The blurb in the magazine says it's $92 for the three tile section (8 in. wide x 45 in. tall). Try looking at Hasting Tile & II Bagno Collection. 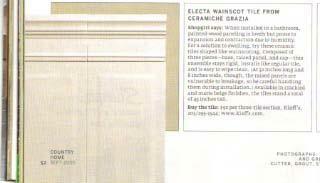 The Cermiche Grazia Boiserie series is a matte-glazed ceramic beadboard wainscoting. You can see it at www.hastingstilebath.com. I think is't very classy looking but probably very expensive.